Celebrity chef Gordon Ramsay is known for his appearances in popular television programs such as “Hell’s Kitchen” and “Kitchen Nightmares”. However he is also a marathon runner who believes in eating food that is not only delicious, but also healthy. In his book, Gordon Ramsay’s Healthy Appetite, he offers over a hundred recipes that are designed to fit in with our busy lifestyles. The recipes are full of flavor but will also help you maintain your ideal weight and support a healthy cardiovascular system. This book includes simple recipes and fun ideas for healthy breakfasts, brunches, workday and weekend lunches, dinners and desserts. There are chapters that focus specifically on foods for kids, barbeques and entertaining. Colorful photographs of the recipes are included so that you can get an idea of how the completed meal will appear. Gordon Ramsay provides advice on how to prepare foods so that they are healthy as well as being full of flavor. There is a section on healthy cooking techniques such as steaming, poaching, stir-frying, sautéing, braising and roasting. These methods capture and retain the taste and nutrients of foods without adding excessive amounts of fat. Basic information is included in Healthy Appetite regarding how to create a balanced diet and Ramsay also offers suggestions for healthy snacks. Fats should be eaten sparingly, but Ramsay emphasizes that essential fats are very important for our health and explains the difference between the different types of fat. The recipes include healthy fats such as olive oil, avocado and nuts. The intake of sugar should also be limited so the recipes contain minimal amounts of added sugars. The dessert recipes primarily involve the use of fruit with the occasional use of dark chocolate and low fat dairy products. Fruit, vegetables, low fat yogurt, goat cheese, ricotta cheese, eggs, chicken, fish, shrimp, beef, basmati rice, wild rice, oats, whole grain bread, pasta, noodles, chickpeas, nuts, seeds, dark chocolate, avocado, extra virgin olive oil, balsamic vinegar, herbs and spices. Healthy Appetite does not include any exercise recommendations although Gordon Ramsay mentions the benefits of regular exercise to strengthen the heart. 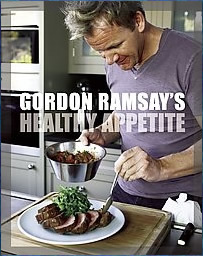 Gordon Ramsay’s Healthy Appetite retails at $23.97. Promotes the consumption of a wide variety of healthy foods. Encourages the enjoyment of meals and appreciation of quality food. Gordon Ramsay educates dieters about sources of healthy fats. Offers recipes that are flavorful as well as healthy. Includes ideas for healthy meals for kids. Provides meals that can form the basis of a healthy eating plan that the whole family can enjoy. Not specifically a weight loss program. Nutritional information is not provided for the recipes. Does not include exercise recommendations. Gordon Ramsay’s Healthy Appetite is a recipe book designed to give you a variety of meal options that are suitable for a busy lifestyle. This book will appeal to dieters who appreciate quality meals and enjoy cooking but would also like to lose weight and improve their health.